Here's a quick card I made using the Imagine More cartridge that comes with the Imagine machine! It is sized at 4-1/4" x 5-3/4" and was made by first printing and cutting out the tea cup, the scalloped oval behind it (filled in with blue color) and the scalloped rectangle (also filled in with color from the designer patterns). I cut the cup at 3", the oval at 3-1/2" and the rectangle at 4". 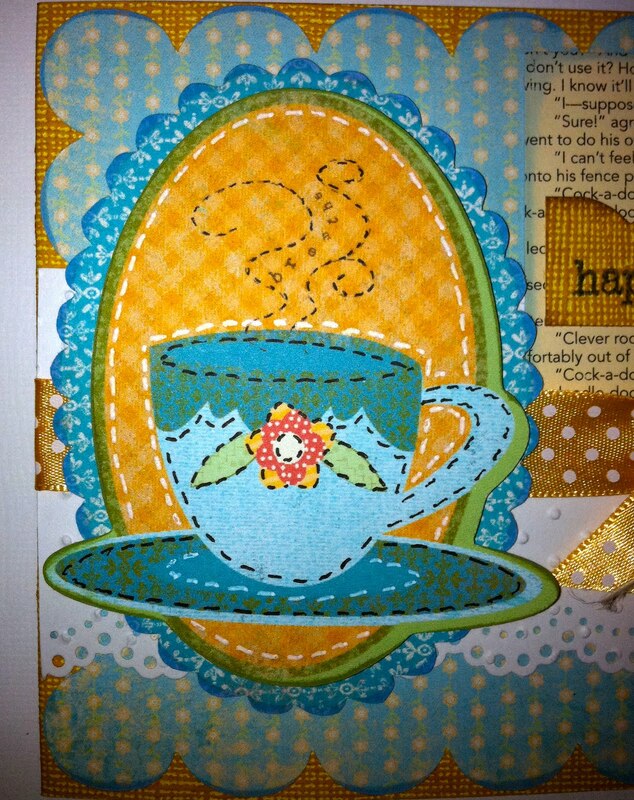 I used black and white pens to add stitching on the tea cup image. That image consists of the tea cup, yellow background and green outline and cannot be divided into layers. 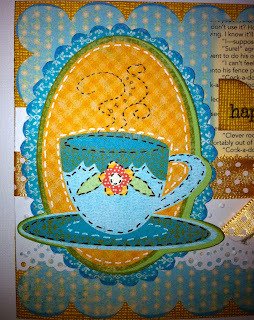 Cardstock was by Core'dinations; ribbon and button by Papertrey Ink. 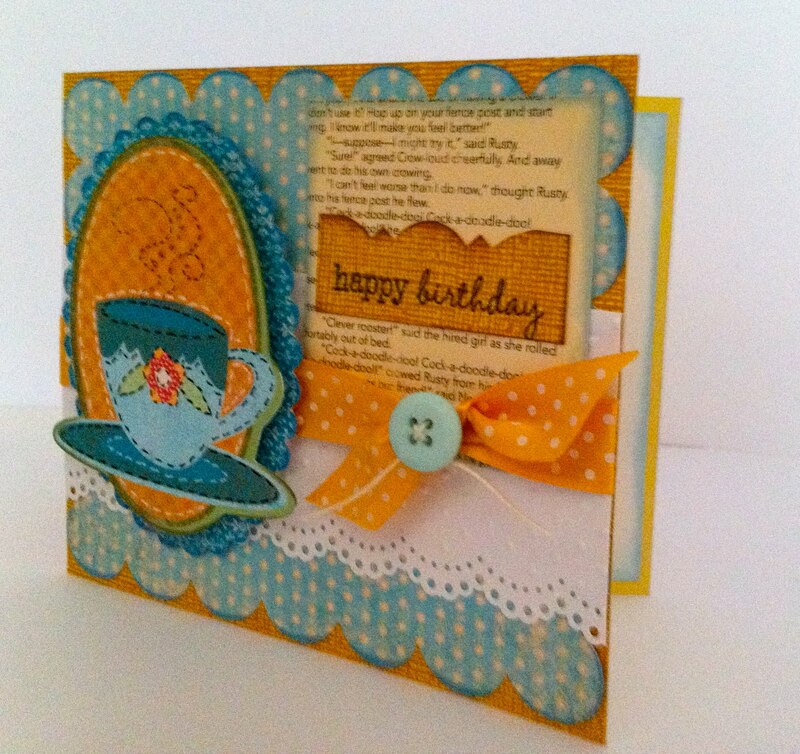 Happy Birthday stamp by Darcie's. Text paper by October afternoon. Scalloped lace border punch by Martha Stewart. Scalloped tea cup was pop dotted onto the card for added dimensional interest. Tuesday: Big HSN kick-off for the Imagine Machine with showings at 12:01 a.m. - 2:00 a.m. (EST) and more! Check HERE for the HSN schedule! There will be 24 hours of crafting/scrapbooking!! Set your Tivos! Tim Holtz will be on for the first time as well as my favorite Anna Griffin and Jinger Adams! Don't miss out! Melanie and I will be on the Cricut facebook page Tuesday from 8:30 p.m. - 9:00 p.m.! We will have some fun times for you so don't miss out! Be sure and check the Official Cricut Twitter and Facebook sites all day today and Tuesday for giveaways, "ask the expert" segments, fun videos and MORE! Wed.: More Imagine info and I will be the guest main writer on the Cricut Chirp newsletter so check it out! I am so honored to have been able to do that - it was a blast! Thursday: Helloooooo, Thursday! Be sure to check back as I will have some great giveaways (as always!) and previews of BRAND NEW cartridges! Everyone will want to see these!! Friday: More Helloooo Thursday projects. For those of you concerned this will become an Imagine blog only, let me reassure you that I will NOT be doing that. However, I do need to get some information and projects up about the machine so that my informational data on the site is useful and up to date. So, bear with me while I get all that loaded. All of your "Imagine" cards are so cute. Do you find it using the ink up quickly? Lookiing forward to more Expression cards, too! Fantastic! Sounds like a blast! Cute card. Love the tea cup! oh my - this is so cute! *swoooon*. Those are some of my very favorite color combinatins. You could say they are my cup of tea :D. TFS and thanks for all the information! Oh wow! This is just such a gorgeous card! Great job! The teacup card is just the cutest ever. Awww Joy! You always make my day with your beautiful cards!!! I love this! It helps that one of my favorite items in my life is my Grandmother's tea cup collection from the 40's and 50's. Something about tea cups, I don't know..LOL! Thanks so much for sharing all your info on this new machine, and all your talent! 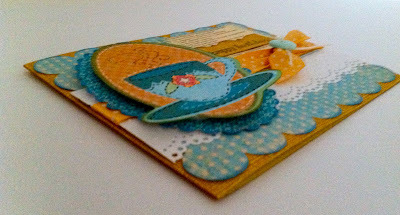 What a pretty teacup card. Thanks for sharing all this information. I can't "imagine" that anyone minds if you gush about your new toy for awhile. It's very informative and fun to see! I dont know how often you look for new comments but I was so taken with your card that i followed how you did it and made one for myself to familiarize myself with my new imagine. Of course I didn't have the same papers but the design is basically the same as yours!!! You are such an inspiration and help in developing my cards!!! Very cute card! I love seeing different things to do with the imagine.